Description: The Sport Bracelet pattern is very easy, so is a suitable Macrame project for young children. 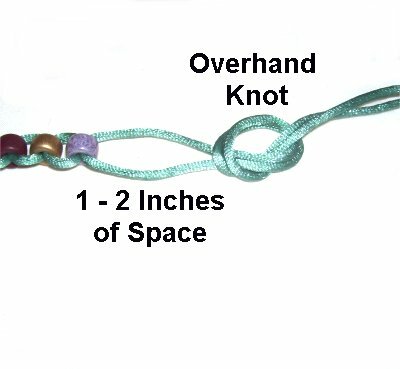 The most unique thing about this Macrame bracelet is the fact that the beads slide along the cords. So as you are at your favorite sport game, you can keep count of the runs, goals, or touchdowns. It's better to use smooth material, such as the Satin cord in the example. 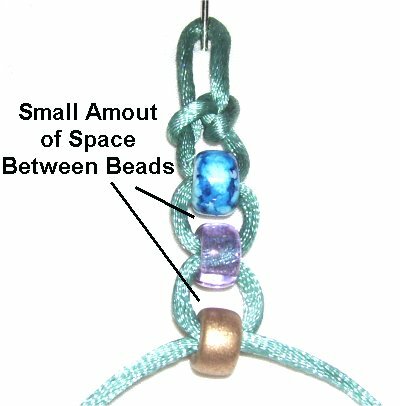 Make sure the beads have large enough holes so they slide back and forth easily. You can use crow rollers, which are glass, or plastic pony beads. Important: When using Satin or other delicate material, do not put the pins through it. Lean the pins over the cord or use the Cross-pin Technique. You can also use tape. Step 1: Cut one cord, at least 4 times the size of your wrist. Prepare the ends with glue and allow it to dry completely. Secure the cord to your board at the center. 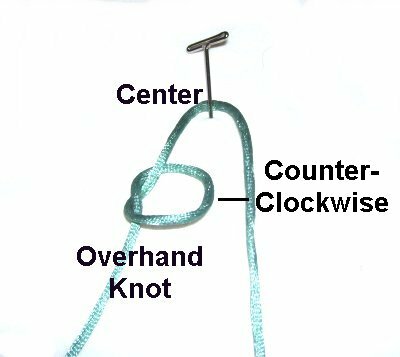 Tie an Overhand knot with the left half of the cord, rotating counter-clockwise. Step 2: Use the right half of the cord and make a clockwise loop. 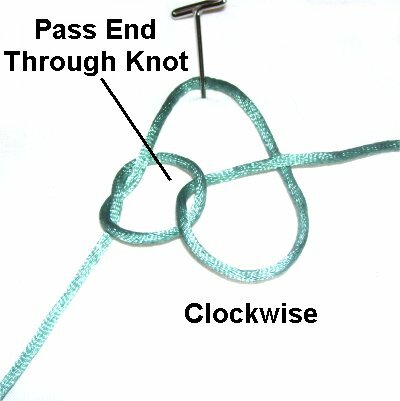 Pass it through the first Overhand knot. Tighten the knot slightly by pulling on the ends. Hold the folded area at the top as you tighten, forming a loop. Make sure it's the right size for the button. 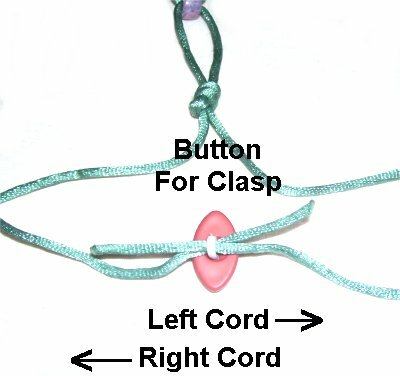 This is the completed Hanger knot, which is a type of Linked Overhand knot. Click on the link to see other options, if this one seems to complex. Step 3: Hold the first bead on it's side, so the hole runs side to side (horizontal). 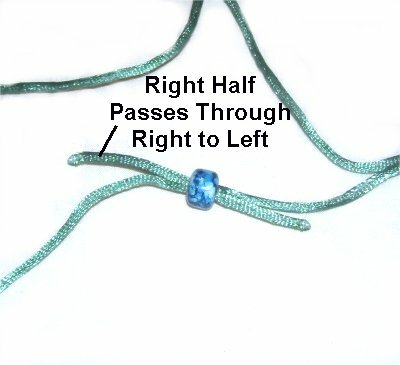 Pass the left half of the cord through the bead from left to right. Step 4: Pass the right half through the bead from right to left. Add more beads in the same manner. Position them so there is a small amount of space between each one. Stop when the Sport Bracelet is 1.5 inches less than the size you want. So for a 7-inch bracelet, stop at 5.5 inches. Step 5: Leave a space approximately 1 - 2 inches in size. 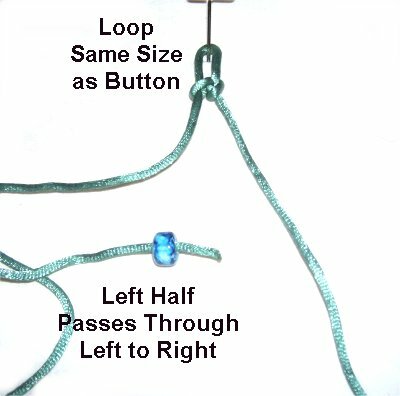 Tie an Overhand knot using both ends together. Step 6: Add the button for the Sport Bracelet the same way you did the beads. The left half of the cord passes through the shank from left to right. The right half goes through in the opposite direction. 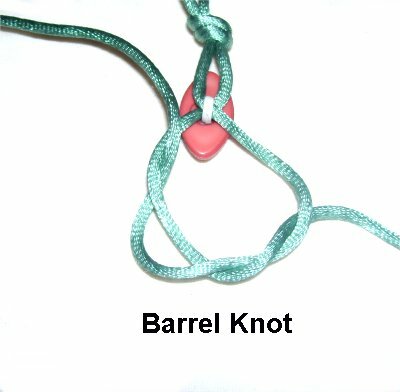 Step 7: Use a Barrel knot to secure the button: Start by making an Overhand knot. Wrap one end around the loop again. As you tighten, apply glue next to the shank of the button. 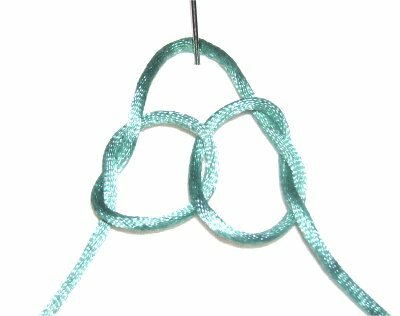 Add more on the outside of the knot after it's tight. Wait until the glue dries and cut off the extra material. Have any comments about the Sport Bracelet? Contact Me.